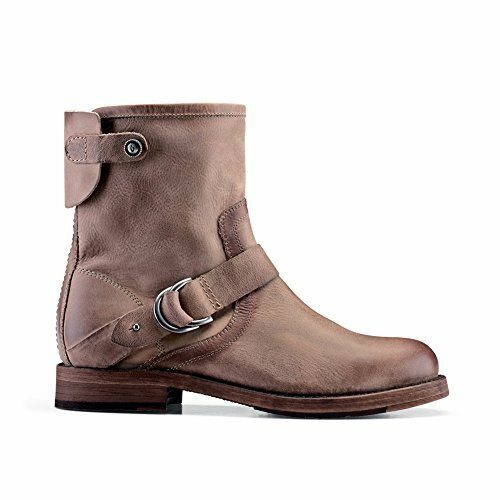 Upper - Vegetable-tanned, full-grain, high character leather, or full-grain tumbled leather with a matte finish. Leather lined heel to forefoot. Unlined shaft to maximize suppleness. Instep strap with double ring closure. Burnished finish. Footbed - EquilFit, dual-density PU. Durable chassis provides stability and arch support. Softer top deck offers extra cushioning for step-in comfort. Leather lining. Removable. Outsole - Leather outsole with rubber taps in forefoot and heel. Goodyear Welted construction. Features - Half zipper with metal pull tab. Custom metal snap. Measurements - Heel Height: 1 N"; Shaft Height: 7". Product measurements from size 7 US.